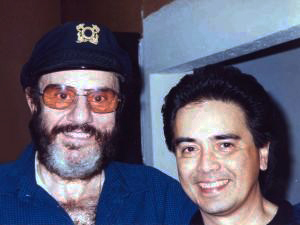 I first met Johnny Otis in the mid 1990s when he was still doing a live broadcast of his weekly radio show on KPFA-FM at his cabaret-café in Sebastopol, California, where he lived. Johnny was performing live on the air in his downtown café, a featured segment of his show. He invited me to sit in on a number. I remember it well. It was one of my favorites, “My Babe,” a tune that was a big hit for famed blues harmonica player and singer Little Walter. I guess Johnny figured I must have known it. He was right – and I immediately felt comfortable sitting in with this “larger than life” rhythm and blues legend. One day, Myrna and I returned to the café and brought Afro-Filipina blues and soul diva Sugar Pie DeSanto and her brother Domingo Balinton. It was quite a reunion for Johnny and Sugar Pie, who had not seen each other in years. I was immediately struck by the fact that he called her “Palaya” – a nickname that Sugar sometimes called herself along with close friends and family members. Sugar Pie’s real name is Umpeylia Balinton. My friendship with Johnny grew quickly as we found many things in common that we enjoyed, in addition to music. I had always been a fan of Johnny, his music and his politics. I used to perform “Willie and the Hand Jive” with a band I had a in the mid-‘80s called the California Cadillacs. I had also performed with Big Mama Thornton several times, along with Charles Brown, Lowell Fulson, Percy Mayfield and several other artists Johnny had worked with. He showed me his menagerie of different birds as well as the Koi fish he had in a pond. I was very intrigued by the life-size sculptures on his property of three voluptuous naked women. There were paintings in the house also, against the wall in the living room, where he also had a grand piano. Phyllis, Johnny’s lovely wife, who is Afro-Filipina, also became a very good friend to Myrna and me. My visits to the café and to the Otis residence nurtured my friendships with different members of his band, which included his son Nicky Otis, a drummer, and grandson, Lucky Otis, who played bass. Johnny’s band would eventually accompany me on my CD “Train Through Oakland,” with Johnny playing piano, vibes and even drums (on one cut). That came about when I asked Johnny simply – would he produce a CD of me. He graciously offered his band, his recording studio, an engineer and his own musical contributions of several songs. In addition, I became a house guest during the many weekends we spent recording, mixing and mastering the CD. It was definitely more than I could have ever imagined. Even now, after all these years and Johnny’s recent passing, I am still in awe of this enormous gift from someone who had already “done it all” and certainly didn’t need to produce one more album or one more artist. I am indeed humbled by his generosity and gift as a friend. Although I never felt that my playing and singing was anywhere near the level of artistry that Johnny had long been associated with, I nevertheless felt honored that he would work with me to record my first CD as a leader. “Train Through Oakland” and the experiences surrounding the making of it, will always remain one of the most memorable milestones of my life. It will stay with me forever. It was also around this time that Johnny decided to teach a class on the history of Black Music in America. He joined forced with Larry Douglas, one of the trumpet players in his band and a college professor, to create a concept for the class and propose it to the Peralta Community College system. The class was Music 15-B: Jazz, Blues and Popular Music in American Culture, a 3-unit college class transferable to the UC system. It also fulfilled lower division requirements for Ethnic Studies, Humanities, History and other Liberal Arts departments. The class was an instant hit. I remember Johnny calling me one day to ask if I would like to work with him in the class as its coordinator. He knew I worked with computers and multimedia. He wanted me to help him with curriculum development, preparation of handouts, the showing of films, and the scheduling of speakers and live bands. His concept for the class was revolutionary and drew large enrollments. It holds the record for the most popular class ever in the history of the Peralta Community College system. This intense collaboration between Johnny and me brought us closer together, as I would often consult with him on all the different aspects of his class. He lent me his books, gave me numbers of different speakers and entertainers to contact. I essentially became his “right hand man” as he would often refer to me. I even did the payroll – telling his wife Phyllis who to make checks out to and disbursing those checks every Monday night. 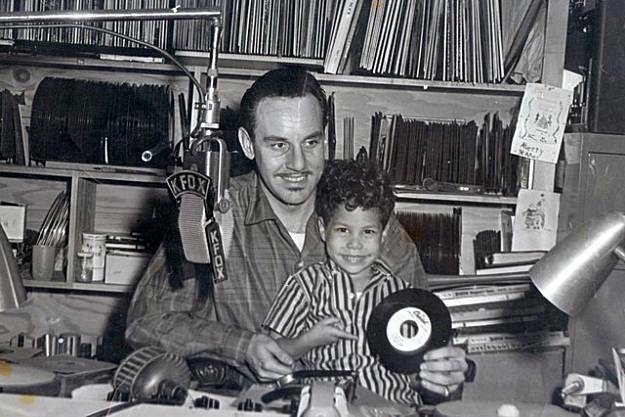 The class was incredibly popular, with the help of Johnny’s radio show and word of mouth amongst the students and the community San Francisco Bay Area music and Johnny Otis fans. Gradually, Johnny’s health deteriorated. This inevitably meant the end of the class as we knew it. I tried running the class without Johnny’s presence, bringing in Lucky Otis, his grandson. Peralta Community College District decided to “franchise” the class and offer it at each campus. At one point I was assisting the professors at both Berkeley City College and College of Alameda, going from one campus to the other on Monday nights. The funding for the class was also reduced dramatically, making it impossible to book the live entertainment and speakers like we previously had done. This became for me – the “end of an era.” It was like the end of Rock and Roll and early Rhythm and Blues itself – it’s time had come and gone. Eventually, Johnny and Phyllis decided to sell their property in Sebastopol and move to Southern California where their two daughters and son Shuggie live. This is where Johnny would spend his remaining years, close to his family and out of the public eye. He had essentially “retired” and made the choice to no longer pursue all the different activities he was known for. On Dec. 28, 2012, Johnny reached the age of 90. He died at 12:05 a.m. on Jan. 17, 2012. He had lived a full life as head of his family, as a musician, producer, mentor, talent scout, owner of a record label, radio personality, politician, civil and human rights activist, poet, writer, painter, sculptor, cartoonist, chef, church minister, educator and organic farmer. It was a life of the inspirational and consummate “Renaissance Man” – a life for the ages. There will never be another one like him. Mabuhay ka Johnny Otis! A society can only be established and developed by creating athirst of learning in its people. Even an already established society cannot make progress if its educated people do not make use or spread their knowledge. Great post, Really Loved it!